Former City Council member Sal Albanese is shifting the debate among mayoral candidates to a serious discussion about the welfare of the city's working men and women, and their families. Albanese takes an uncompromising stand against political corruption, special interest group influence, and public servants serving corporate interests that undermine the well-being of the working class. A retired public school teacher, Albanese has gold-plated union credentials and understands the needs and vulnerabilities of the next generation. As a private-sector union, we join the Machinists, along with several public sector unions in supporting Albanese's candidacy and run for mayor. TWU Local 101 Supports: The Workplace Bullying Law "S-4289"
Work interference – sabotage – which prevents work from getting done. It is a problem that has invaded the life of 37% adult Americans without invitation. In its more severe forms, it triggers a host of stress-related health complications -- hypertension, auto-immune disorders, depression, anxiety to PTSD. The person's immediate job and often career are often disrupted. 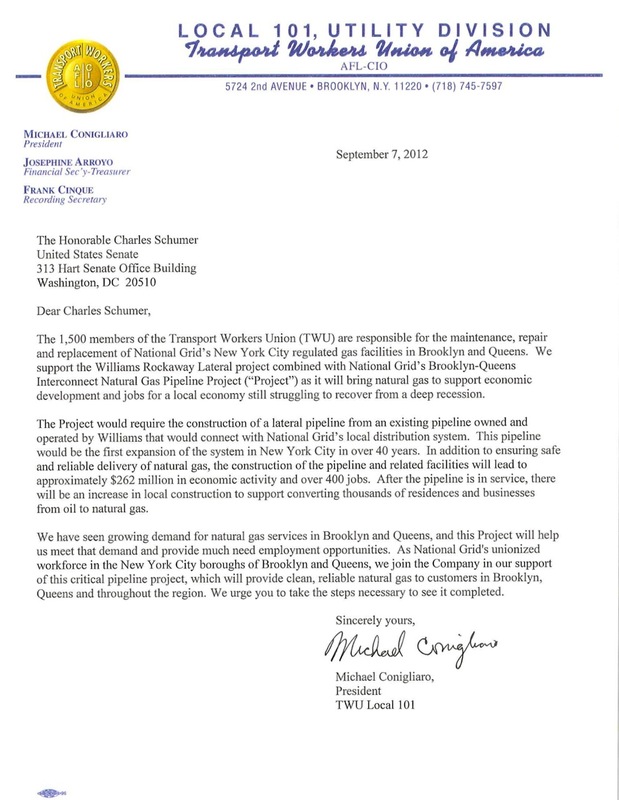 The letter below expresses the Local's support for the Williams Rockaway Lateral project and National Grid's Brooklyn-Queens Interconnected Natural Gas Pipeline Project because of the positive impact these projects would have on our local community, including economic development and job growth. TWU Promo Spot: "What Have Unions Done For Us?" Copyright and property of the Transport Workers Union International. Reproduced with permission by TWU Local 101.